LONDON/NEW YORK (Reuters) - Bitcoin rocketed to a lifetime high just shy of $16,000 on Thursday after climbing some 60 percent over one week, intensifying the debate about whether the cryptocurrency is in a bubble about to burst. But critics say that the price run-up is a bubble that has been driven mostly by speculation, leaving bitcoin vulnerable to a sharp reversal. JPMorgan Chase & Co <JPM.N> Chief Executive Jamie Dimon famously called bitcoin a fraud in September. 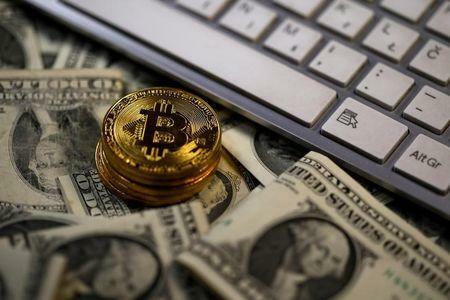 The latest move brought its so-called market cap, its price multiplied by the number of bitcoins in circulation, to nearly $280 billion, according to Coinmarketcap, a trade website. By comparison, the market value of Wal-Mart Stores Inc <WMT.N> is around $288 billion. Analysts said the launch slated for this weekend of bitcoin futures by Cboe Global Markets Inc's <CBOE.O> Cboe Futures Exchange, one of the world's biggest derivatives exchanges, was helping drive up the price on expectations it would draw more investors to the market. The CME Group will launch bitcoin futures one week later, while Nasdaq Inc <NDAQ.O> plans to get into the mix next year. It is not clear to what extent big U.S. banks will participate in the new bitcoin-related activity. Goldman Sachs Group Inc <GS.N> will clear bitcoin futures for certain clients when they go live, a spokeswoman said on Thursday. Bitcoin climbed as high as $15,995 on the Luxembourg-based Bitstamp exchange <BTC=BTSP>, up more than 14 percent on the day. It was last at $15,791.51. "It will hit potentially $20,000 because so much capital is coming in and it's the most liquid secure coin out there," said David Drake, founder and chairman of DLJ Capital, a family office in New York.